Cities are becoming smart. By investing in solutions that take advantage of the potential of big and open data to increase efficiency, cost savings, and opportunities for the public, cities are rapidly transforming into “smart cities.” But with over 90,000 local governments in the U.S., how do you know what cities will benefit the most from smart city initiatives? 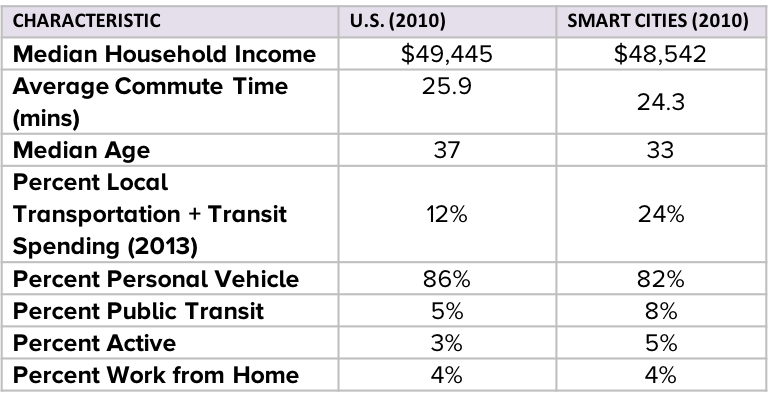 Here at CivicConnect we set out to answer that question, with a special focus on smart mobility. Taking an analytical approach, we identified and ranked 103 cities that would be the best candidates for smart cities initiatives using a smart city scoring system. Although there is a somewhat diverse geographic spread, the identified smart cities display a clear cluster in the west and south. The map below displays in more detail the geographic spread of the cities analyzed and their smart city scores. The darker the circle, the higher the smart city score. The results of this analysis show that smart cities have distinguishing characteristics that can be used to better advance and fit smart city, and more specifically smart mobility, initiatives. For more information on our methodology and implications of our results, click here for our white paper. © Copyright 2019. CivicConnect. All rights reserved.